In 2003 I graduated from Virginia Tech and was not quite ready to jump into the job market. I convinced my husband John to move away with me to Hawaii for a year where we worked at a hotel on the beach and basically just spent a bunch of time lolly gagging around. During that time, I began creating body butters, solid perfumes and melt and pour soaps for sale at the North Shore Country Market on Oahu. It was a really crazy, beautiful time! When we returned home to Richmond, the venture was abandoned and I worked at a few places including my family’s real estate business. Then, my 2 sons came along and I decided I needed to be at home more, but wanted to reincarnate my business as well. That was almost 3 years ago, and this time around I am taking things a bit further – working completely from scratch using olive, shea, and coconut oils. I literally created every recipe on my own using whole ingredients. 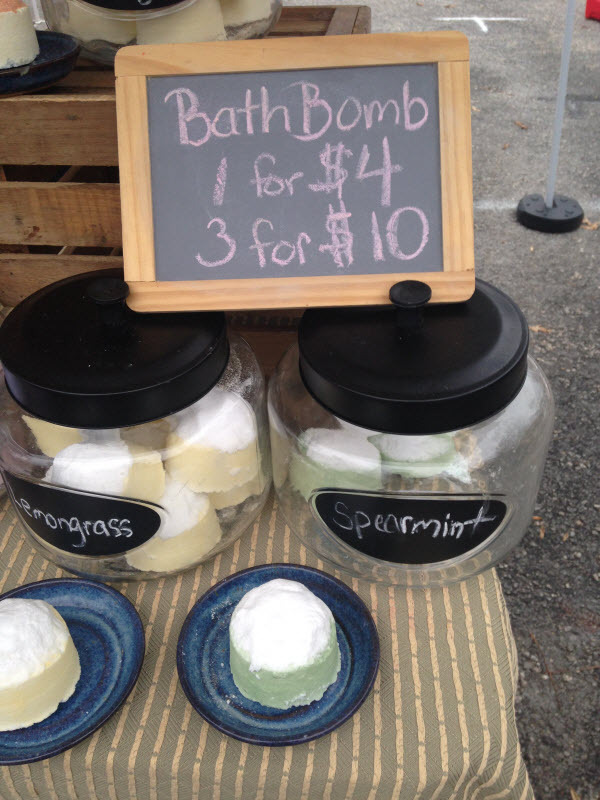 When you’re not vending at the farmers market, what do you spend your time doing? I am home running after 2 crazy boys, Morgan and William (Willie and Mo) and cooking! I am often surprised by the shear amount of food our little family can go through. We are total foodies, with a preference for fresh stuff from our garden! Recently we even began making some of our own cheese and yogurt using Old Church Creamery’s milk. AMAZING!! With a full-time life at home, I often make soap in the late evening after the kids are tucked in. Seriously, the midnight oil is often burning – it’s the only way I can get anything done. Coffee in the AM is a must in our household. What’s something about you or your business that people might find surprising? I do home parties! Affordable luxury can be hard to come by. I believe we all look forward to the little luxuries that can brighten even the most mundane tasks, such as washing. If you are thinking of supporting small business and want to have a casual gathering in your home, get in touch. I would love to pop over, set up my display and talk about how my products can provide that bit of pampering that we all crave. No high pressure sales (Ugggggh! I hate that…) Just an intimate chance for folks to ask questions and get to know all about natural body care. Toss me an email at bonairnaturals@gmail.com if you want to know more. Jack of all trades! I have been a media buyer, product research coordinator, and most notably a small time home-builder. I still have a building company in place should I ever have the means necessary and the desire to jump back into the real estate game. 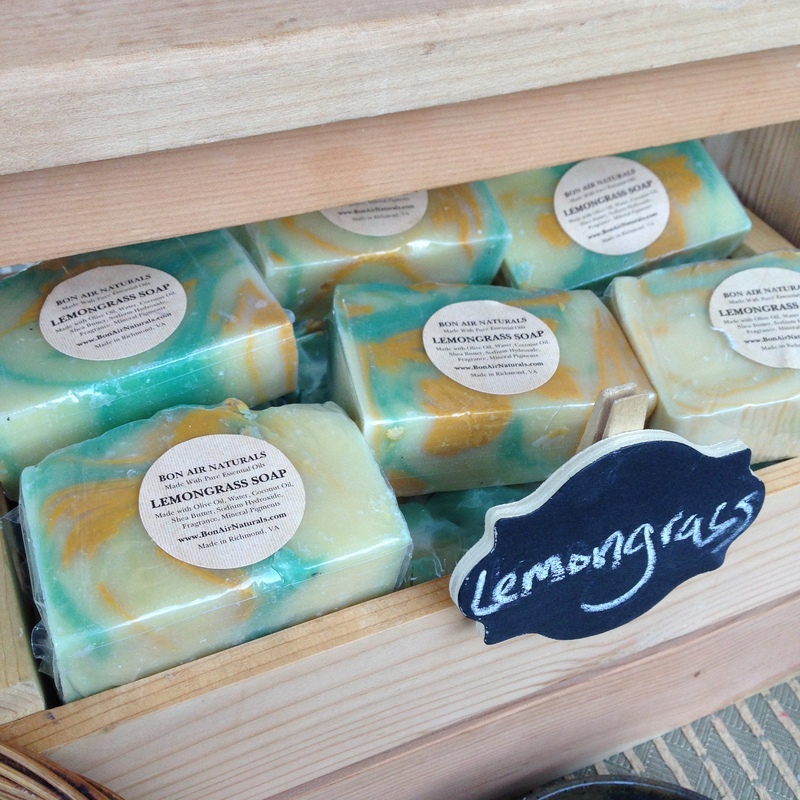 The greatest challenge is getting the word out about my soaps and being patient enough to let the business grow. When you are a micro business, you can find yourself in a major churn, spending money often before it even comes in. Reining in expenses and trying to figure out what efforts lead to the best direction for my business is a constant effort. I feel fortunate to connect with other local businesses through the farmers market here in Forest Hill. We are a different breed, i tell you…The people here are an amazing inspiration to me even when i want to give up. Having a small venture is sometimes like gleefully running into a brick wall over and over again hoping that eventually you will push through. Make no mistake, this is hard hard work. But when you love what you are doing, it goes a long long way. At the end of each day i am weary and exhausted, but smiling! 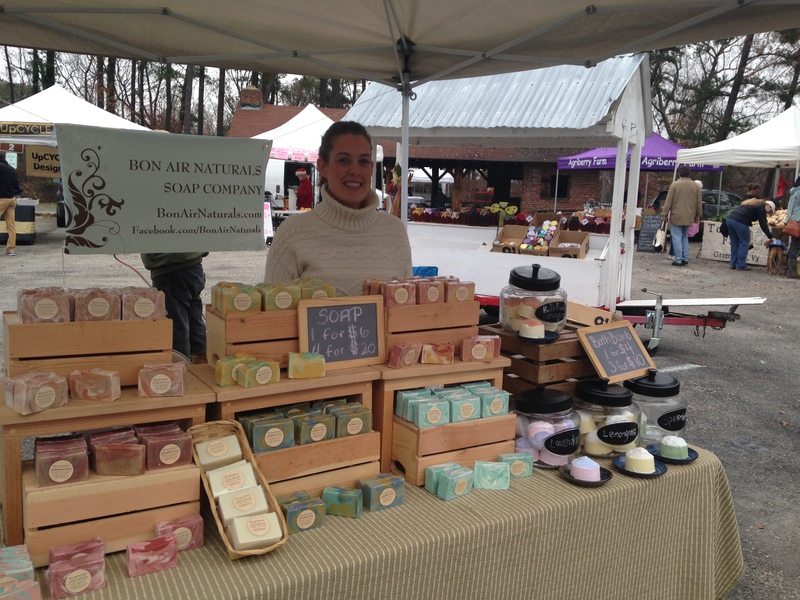 Come visit Bon Air Naturals at the market, 9 am – 12 pm!